Is it a bird…is it a bus…Well, it’s definitely not Superman, although Hardik Shah would love Mumbaikars to fly with his new and unique concept – a restaurant-on-wheels. Called The Moving Cart, this mobile eatery is grabbing eyeballs. It’s also Mumbai‘s first and India’s second mobile restaurant. Climb aboard the red-and-yellow double-deck bus, settle down to finger-licking grilled chicken shaslick or hara bhara kebab and take in the sights of the Queens’ Necklace at Marine Drive. Life is good! It’s easy to be seduced by the sumptuous menu and promise of the sea. But not so fast! Since the meals are pre-cooked, bookings are only accepted online. Launched in March this year, Mumbai’s latest attraction has room for 20 on each deck. 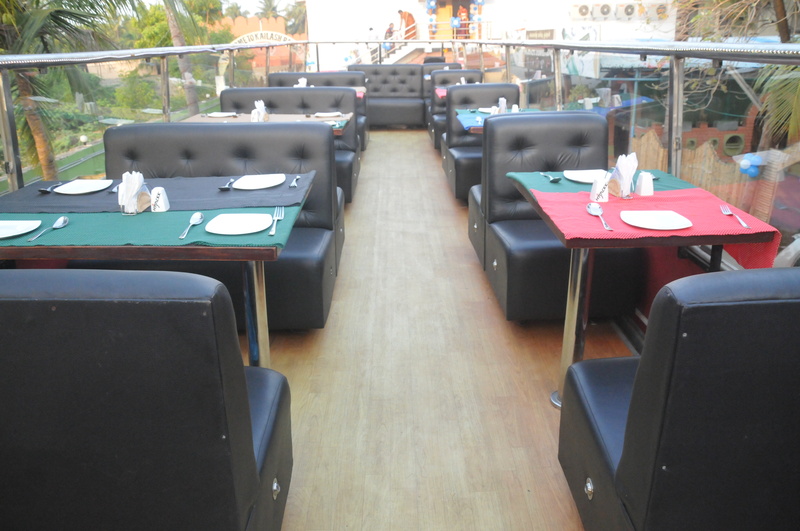 The lower deck is air-conditioned and has mood lighting and soft music. A large projector screen relays cricket matches and movies. The upper deck is open to the sky and hosts live music. While you cruise along for 90 minutes, you will be served a five-course meal (Rs 1,200 veg; Rs 1,400 non-veg) and, why, you even have a hostess to make sure you’re comfortable. 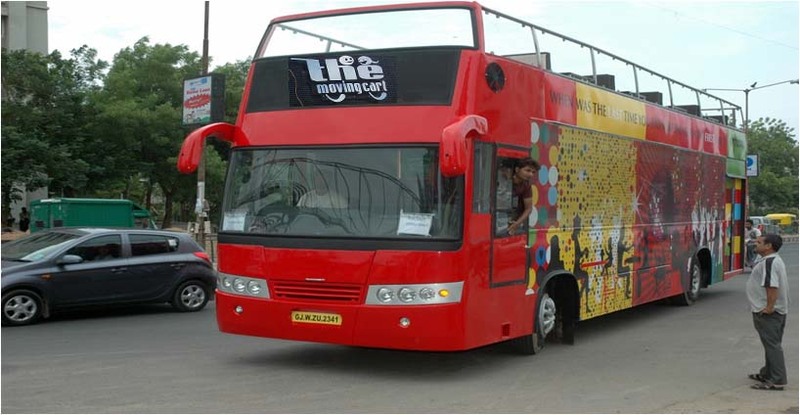 “Chennaiites were smitten by the concept when I launched my first bus there in 2011. The bus received fantastic footfalls and word-of-mouth brought in lots of curious customers,” reveals Chennai-based Shah, who floated The Moving Cart with seed capital of Rs 1.4 crore from his personal funds. Encouraged by the experience in the South, Shah roped in John Dias as co-founder and, together, they launched the second bus in Mumbai. Shah is not a first-time entrepreneur. After cutting his teeth in the garment export business, he launched a private bus service on the busy Mumbai-Pune route. But it was food that moved him, tempting Shah to open a lounge in Chennai. “I know the difficulties of the food service business, and even if the restaurant is a hit, it takes 2-3 years to break even. I wanted something quicker, more unique and interesting,” he explains. But The Moving Cart is more than a mobile restaurant. Apart from the three regular services a day, the bus also hosts corporate functions, birthday and anniversary celebrations, kitty parties and engagement ceremonies. > The Moving Cart owns and runs both its buses. Each bus (a combination of Mercedes, Tata and Volvo) required an investment of Rs 1.1 crore. Plus there’s the salaries of 12-15 employees per bus to be paid. Shah says that although it takes 6 months to a year to break even, revenue is coming in from hiring out the buses for events and this helps run the business. Declining to reveal how the events are prices, he says, “It depends on the menu selection and number of people. It’s like a regular banquet event where we customise the menu and multiply it by number of people.” The rest of the revenue comes from catering and branding on the busses. Price is a differentiating factor in the success of a business and Shah has had his share of juggling to do. “The best South Indian meal at Sarvana Bhavan in Chennai costs Rs 100. We had to tread very carefully when it came to pricing as the Chennai crowd is quite conservative. If you price it premium, you will lose customers.” While meals cost Rs 775 (vegetarian) and Rs 875 (non-vegetarian) in Chennai, they cost Rs 1,200 and Rs 1,400 in Mumbai, respectively. The Moving Cart faced some unique challenges before it launched. “The RTO couldn’t slot us as a regular bus since we were a double-deck bus with an open top. The bus also served food that required some heating. All these factors put the RTO in a quandary and they had to create a separate category for us,” explains Shah, who did the rounds of the RTO for 4 months to acquire the necessary licences. That was not all. Food on a moving bus calls for a different set of dynamics and Shah had to do some clever thinking so that meals could be served hot and fresh. “By the time the food is served to guests, it’s already heated four times since it was cooked and then ferried to the bus. We had to customise a menu with dishes that withstood this kind of re-heating and make sure that taste wouldn’t be compromised on repeated heating,” reveals Shah. Also, the tables had to be fitted with anti-skid mats to prevent spill-over and the staff had to be trained to manage and serve food on the go. The Moving Cart is gathering momentum and plans to wow adventurous foodies with two more buses in Mumbai, one each at Worli Seaface and Versova, as early as next month. Don’t say you weren’t warned! Finally I got an interesting piece from you. The concept looks interesting and tempting. Should try once. I must say, your articles give knowledge and information about interesting ideas. Regards…!! !